Obviously, the amount of money a person has influences the amount of money he or she invests and the manner in which their funds are invested. But wealth levels also play a role in how an investor perceives himself or herself, and those perceptions then color the manner and extent of their investment decisions. It is these differences which Spectrem investigates in its wealth segmentation series. A comparative analysis of how investors from different wealth levels perceive themselves can assist advisors when dealing with clients who come from different angles because of their wealth level. From the Mass Affluent investor, with a net worth up to $1 million, to the Ultra High Net Worth investor, with a net worth between $5 million and $25 million, Spectrem’s studies reveal the habits and behaviors of affluent Americans, and provides insight into how their wealth level affects their decision-making. “There are answers we receive in our studies that make sense based on wealth level, but the scope of the differences are stark and compelling,’’ Spectrem president George H. Walper Jr. said. The most revealing question to which investors in the Spectrem study Financial Behaviors and the Investor’s Mindset respond is “Are You Wealthy?” The investors are asked to place their response on a scale from 0-to-100. Mass Affluent investors placed themselves at 56.85 on average, while Millionaires (with a net worth between $1 million and $5 million) placed themselves at 65.95 and the UHNW investors placed themselves at 77.56. What does this information reveal? First, it reveals that the perception of wealth status does indeed follow a regulated pattern from one wealth level to the next. But, demonstrably, it also reveals that many investors with a net worth of $5 million or more do not necessarily see themselves as wealthy, or at least overly wealthy. While these numbers are averages, they are indicative of the mindset of investors which advisors need to get to know and understand. An investor’s perception of wealth will go a long way toward the investor’s decision to invest, and his willingness to take risks with investments. Risk tolerance is directly related to wealth levels, and perception of wealth probably plays a role as well. Asked to place their risk tolerance between “most aggressive” and “conservative”, 77 percent of Mass Affluent investors self-define as “conservative’’ (23 percent) or “moderate” (54 percent). Millionaires reported 60 percent as “moderate’’ and 16 percent as “conservative”. Sixty percent of UHNW investors call themselves “moderate’’ and 10 percent call themselves “conservative”. However, advisors should keep in mind that wealthier investors are going to have a different definition of “conservative’’ or “moderate” than investors with less wealth. A conservative UHNW investor might be interested in an investment decision that a Mass Affluent investor would consider “aggressive”. Advisors must recognize the differences between investors based on wealth and risk tolerance. How an investor feels towards retirement is the best way to determine how their wealth level affects their investing and perception of their own financial wellness. 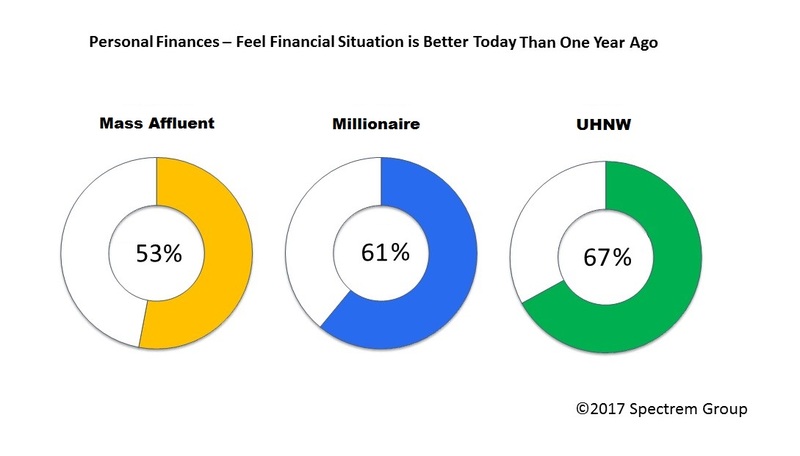 In the Spectrem study, when Mass Affluent investors were asked if they were concerned about being able to retire when they want to, 47 percent said “Yes.” Only 30 percent of Millionaires agreed, while only 11 percent of UHNW investors expressed that concern. In each case, the percentages dropped significantly from 2016. For example, among Mass Affluent investors, the percentage dropped from 56 percent in 2016 to 47 percent in 2017. Similarly, when asked to rank their concern over depleting retirement funds too early on a 0-to-100 scale, Mass Affluent investors rated their concern at 38.91 (still not particularly high), while Millionaires ranked theirs at 27.25 and UHNW investors have virtually no worry in that regard, with a rating of 16.12. Concern over the long-term status of retirement funds can certainly affect the way an investor makes investment decisions. It is natural to assume that wealthier investors are going to have more money to invest than those who are less wealthy. It would be incorrect to assume that just because an investor has a certain level of net worth, he or she is going to be willing to risk more of their assets in order to receive a significant gain, just as it is wrong to assume that investors at a certain net worth level perceive themselves as well-to-do or safe from financial concern. These are characteristics advisors need to identify in each investor to see where they fit the profiles of investors.